Just under a week from today, join me for a live chat with Dan Hanley of The Gay Vegans. Focusing on politics, the chat will touch on why Dan feels being politically active is so important, how you can get involved in your area*, and whether or not Trump’s presidency has a silver lining. After the chat, questions will be taken from the audience. * Given Dan’s location, the conversation will focus mainly on the political landscape of the United States of America. 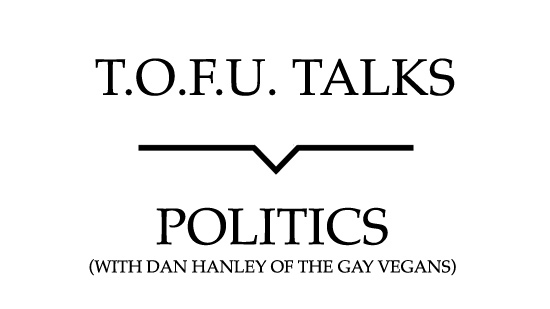 Dan Hanley is a professional non-profit fundraiser who also created and writes for The Gay Vegans blog. He believes in working to make the world a better and safer place for all living beings while building bridges and focusing on the fact that we all have more in common than not. In his spare time, he loves the beach, eating, and engaging folks to vote and become more politically active. He lives in the Los Angeles area with his husband, Mike, and their companion animals.